The EEOC has sued an Atlanta cemetery company for firing an employee the day after the agency interviewed her as part of an on-going investigation. “This suit sends a message that employees should never be punished for speaking to government officials when they investigate discrimination claims,” said Bernice Williams-Kimbrough, director of the EEOC’s Atlanta District Office. I’m sure this employer has an excellent reason for why it fired this employee, and it better be a damn good one. The optics of firing an employee the day after she talks to a federal agency are not good. Indeed, if you fire an employee under these circumstances, you might be the worst employer of 2017. Thank you to the reader who emailed in this nomination. Please feel free to take his lead and submit nominees. The nomination process will remain open until October 31. Beginning November 1, you will have chance to vote in an elimination round, during which we will whittle the list down to the top three to five. 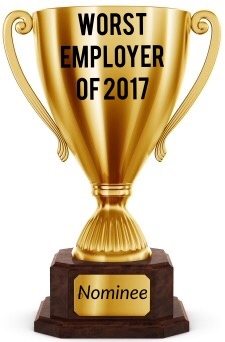 Then, during the first two weeks of December, you will get to vote again, this time to crown The Worst Employer of 2017.